Moo Krob is one of the most sold street food dishes in the kingdom of Thailand. Bangkok is full of street food stalls that sell Moo Krob because the Thais love it. The crispy prok belly is also an ingredient for other Thai dishes like Pad Pak Kana Moo Krob (Crispy Pork Belly with Chinese Broccoli) and you can combine it with many stir fried dishes. If you love meat like the Thais this simple dish is a must try! Wash pork belly and remove hairs from the skin (if necessary). Bring a pot of salted water to a boil and cook the pork belly for 15 minutes or until the skin is soft and translucent. Once the pork belly is done, use a fork to poke holes into the skin and then use a knife to make a shallow grid-pattern in the skin. Mix salt and vinegar and rub mixture into the skin. Allow the pork belly to dry in the sun or a warm place for at least 3 hours. 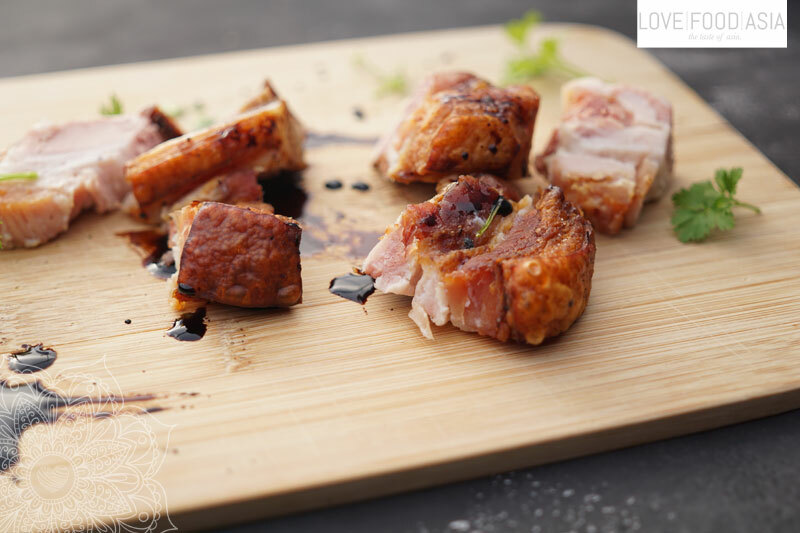 Fry pork belly slices in a pot of oil at medium high heat and cook just until skin is crispy. Chop into bite-sized pieces and serve hot. Moo Krob loves our Thai dipping sauces Nam Prik Kapi and Nam Pla Prik!